SCE Counter shows any characters/text in sequence [strings]. One of its main uses is the countdown. ▪ Extrusion - Adds depth to the characters [in % of the Matrix Size]. This is mainly relevant for 3D. The default value is 100. Valid values range from 0.01 to 100. ▪ Pitch - Defines the distance between elements of the String Table. 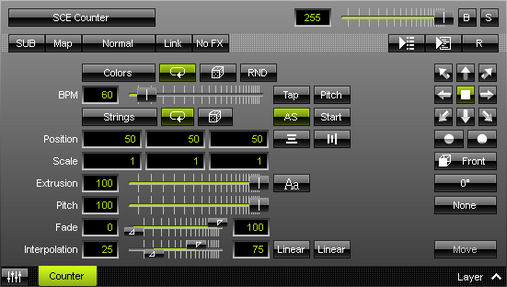 The smaller the Pitch, the more elements will be displayed at the same time. Pitch affects how long elements are displayed within the time set up via BPM. The default value is 100. Valid values range from 0.01 to 999. 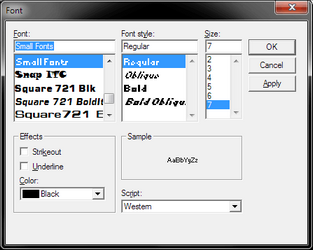 ▪ Fade - Defines if a Fade In and Fade Out is added to the characters. Fade references how long characters are displayed as set up via BPM. The bottom fader defines how long the Fade In takes. The upper fader defines how long the Fade Out takes. The default values are 0, 100. Valid values range from 0 to 100. ▪ Interpolation - Affects Scale and the movement set up via Direction. In this way, it determines how these animations looks like. It basically divides the animations into three parts. The bottom fader defines the first phase, which is the start phase. The second phase is the phase inbetween the bottom and the upper fader. The upper fader defines the third phase, which is the end phase. Interpolation references how long characters are displayed as set up via BPM. It is also directly affected by Interpolation Type 1 for the start phase and Interpolation Type 2 for the end phase. The default values are 25, 75. Valid values range from 0 to 100. Loop Mode - All strings of the String Table will be looped, that means the content of the String Table will constantly be repeated. It is activated by default. Can be used together with Shuffle Mode. Shuffle Mode - Creates an internal list that orders elements randomly to show next. Deactivate and activate again to create a new random list. Can be used together with Loop Mode. Autostart - If activated, the effect will automatically start when the corresponding Storage Place is selected. It is activated by default. Start - Force-starts the effect to start again from the beginning. Vertical Alignment - Defines the vertical alignment of characters [Left, Center, Right] in relation to the Position. The default value is Center. Horizontal Alignment - Defines the vertical alignment of characters [Top, Center, Bottom] in relation to the Position. The default value is Center. Interpolation Type 1 / Interpolation Type 2 - Determine how the animation of Scale and the movement via Direction look like [Linear, Ease In Bounce, Ease Out Bounce, Ease In Out Bounce, Ease In Circular, Ease Out Circular, Ease In Out Circular, Ease In Cubic, Ease Out Cubic, Ease In Out Cubic, Ease In Sinusoidal, Ease Out Sinusoidal, Ease In Out Sinusoidal, Ease In Exponential, Ease Out Exponential, Ease In Out Exponential]. You can set them up individually. The default value is Linear. Last Element Mode - Is only available when Loop Mode of the String Table is disabled. Defines what happens to the last element of the String Table once it has been displayed. The default value is Move. Move - Moves the last element in the same way the previous elements have been displayed and moved. Stay - Leaves the last element on display. Clear - Makes the last element disappear without an animation. Rotation - Allows you to rotate the elements [0°, 90°, 180°, 270°]. The default value is 0. Filtering - Defines how input is processed and displayed. Mainly affects the visual outcome when the input is scaled up or down [e.g., when choosing a different mode for Stretching / Aspect Ratio]. Choose from 2 different modes. The default setting is None. - None - Prioritizes processing speed over image quality. - Linear - Prioritizes image quality over processing speed. This mode may affect performance. SCE Counter allows you to show any characters/text you want. Use the String Table to manage all elements that should be displayed. By default, the String Table includes the elements from 10 to 0 [as a countdown]. ▪ Left Mouse Click - Selects an item in the list. 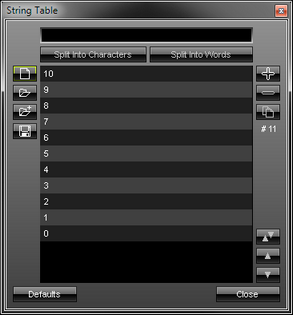 ▪ Ctrl + Left Mouse Click - Allows you to select several elements in the String Table at different positions. ▪ Shift + Left Mouse Click - Allows you to select several elements by selecting 1] the first element, 2] the last element, 3] and all elements in-between will be selected automatically. Element - Allows you to change an element or enter a new one. To change an element, select it first. To add a new element, use Add Element first. Split Into Characters - Is an automatism that helps you to split the element you have just added or changed into separate elements. Select an element in the list first and it will be split into several list entries [incl. word spaces], each with a single character instead of the complete word. Split Into Words - Is an automatism that helps you to split the element you have just added or changed into separate words. Select an element in the list first and it will be split into several list entries, each with a single word instead of the complete sentence. Word spaces will be ignored, except if you enter two word spaces in a row. New - Removes all elements from the list. Open - Loads a previously saved MADRIX String Table from an external file [of the file type *.mstrtx]. Open And Attach - Loads a previously saved MADRIX String Table from an external file [of the file type *.mstrtx] and adds the new elements to the elements that are already included. Save - Saves the String Table to an external file [of the file type *.mstrtx]. Add Element - Allows you to add a new element to the String Table. Make sure to enter the correct characters for the element next. Remove Element - Allows you to remove one or several images from the Image Table. First, select the images in the list. Duplicate Images - Copies the currently selected elements and adds them as new items to the String Table. Swap Position - Swaps the position of elements in the list when several elements are selected first. Position Up - Changes the order, and positions currently selected elements one step higher up in the list. Position Down - Changes the order, and positions currently selected elements one step lower down in the list. Defaults - Restores the default elements of the String Table. Close - Closes the String Table window. ▪ A small window will be shown. ▪ Edit... - Opens the String Table [in the same way you can open the window by clicking on Strings with the left mouse button]. ▪ Open... - Loads a previously saved String Table from an external file [of the file type *.mstrtx]. A new window opens for you to select the file on your harddisk. ▪ Copy - Copies the current elements into the clipboard as a duplicate. ▪ Paste - Applies all elements from the clipboard to the currently focused String Table [Strings]. ▪ Defaults - Restores all default elements of the String Table. ▪ Set up the language you want to use [Russian, Chinese, etc.]. - Regarding Windows 7, only when using Windows 7 Ultimate you are allowed to install additional languages in addition to the standard language. 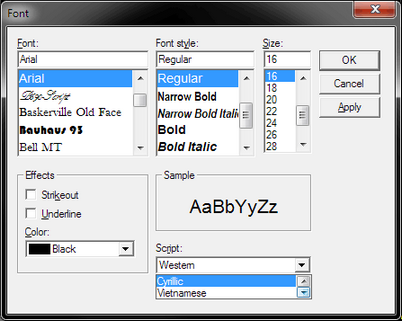 ▪ Click Aa to open the Font window. ▪ Close the Font window.